Janice has been teaching workshops for many years. Recently her workshops have involved collaboration with her partner in crime, Aurelie, who advises on workshop content, layout and technical editing. If you are interested in any of the following workshops please contact the individual yarn store for further details. If you are interested in holding a workshop in your own yarn store, knit group, etc, please get in touch for a full class schedule. A steek is wee bridge of stitches placed over an opening point, between the fronts of a cardigan, the division point of a ‘V’ neck or the start of armhole. A steek allows the knitter to keep working in the round without interruption. Once the knitting is complete, the steek is cut, reinforced and “Ta-Da!”, you have an opening! Working together from Janice’s Mabel McTavish Mug Cosy design, we will learn how to work a simple steek, tackle continental knitting and discuss how the use of both hands for colour work can improve your stranded knitting technique while working in the round. Experience of working in the round is an advantage. Suited to both new and more experienced knitters, Finishing Techniques will help ensure your knitting sheds that ‘homemade’ look. If you avoid sewing up or feel disappointed with the finish of your projects, this workshop is for you! Garment fit, understanding and adjusting tension, blocking, mattress stitch, shaping techniques, short-row shaping, picking up stitches, buttonholes and many more tips and techniques. You must be confident with knit and purl stitches and be able to follow written pattern instructions. New workshop for Autumn 2017 – Designed for those who have enjoyed Finishing Techniques but who wish to cover some techniques in more depth. the importance of gauge (tension) and how to adjust it. how to block different fibres and projects successfully. we will discuss garment fit, and how to access the tools to help you achieve a custom fit based on your level of skill. learn how to use mattress stitch to join different seams, stitch patterns and button bands. try new cast-on and cast-off methods, and discuss where best to use them. – You’re French, aren’t you? 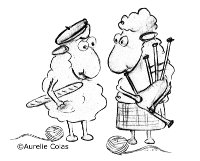 We will be taking a stand at Perth Festival of Yarn this year, a new adventure for The Auld Woolly Alliance! Although intimidated by the challenge ahead, we are very much looking forward to trying something new and meeting some lovely woolly-fibre folks. A selection of printed patterns and design samples from The Auld Woolly Alliance duo, Aurelie colas and Janice Anderson. Woolly Alliance Knit-kits using Jamieson’s of Shetland yarn. - You're French, aren't you?